The Kurdish revolution in Iraq commenced in June 1961. Fifty-seven years in the making, it is one of the most protracted revolutions in the history of humankind, with tragic outcomes. This revolution was initially led by the Kurdish Democratic Party under the leadership of Mustafa Barzani. Ironically, Barzani didn’t believe in a party. He was a tribesman with no formal education, and as a result he pursued tribal ways to transcend organizational discipline. 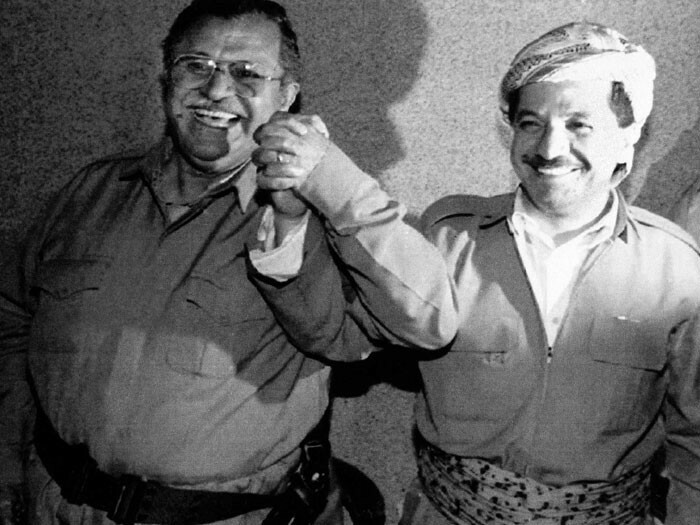 In 1966 prominent members of the KDP—Ibrahim Ahmad and Jalal Talabani—sold themselves to the Iraqi government (Jashi 66) and Barzani became the agent of the Shah of Iran and the CIA, since the Kurds were divided. This revolution was doomed to fail, as its leaders throughout had been agents of Kurdish enemies, Saddam Hussein, the Shah of Iran, Turkish president Erdogan, and the CIA. Talabani and Barzani were unwilling to share the power or give up control. Consequently the division that started in 1966 is alive and well up to the present time, yet with tragic outcomes of the civil war in the 1960s, 1980s, and 1990. In fact, more peshmargas have perished during the civil war than in their fight with Iraqi army. At present the Kurds are facing national annihilation resulting from Masoud Barzani’s call for a referendum on Kurdish independence. He was told to avoid it by friends and foes. Barzani’s popularity amongst Kurds was sinking, as he was casted by the majority of Kurds as a father of corruption and the biggest thief in Kurdish history. He utilized Kurdish resources and revenue from oil to enrich himself and his rival Talabani. What he did had everything with his own personal interests, and he used his actions as a vehicle to boost his tarnished image. He miscalculated the timing, as it was not the right time, and he not only provoked Kurdish enemies, but he united them to crush the Kurds everywhere with devastating impact that will continue for unforeseeable future. The Iraqi constitution was drafted after the American invasion of Iraq. Kurds were the main beneficiaries, as they were granted a full autonomous region with their own legislative power. Moreover, the appointed president of Iraq, oil minister, and secretary of state, and A few other ministers were Kurdish. Iraq shared the proceeds of its oil revenue with Kurds. Moreover, Kurds were permitted to have their fair share of seats in the Iraqi parliament. That was the pinnacle of fulfillment for the Kurdish national dream short of sovereignty. Should Kurdish leaders have been judicious, they would have cherished the opportunity and played genuinely with the Iraqi government to maintain these historical attainments. Then, everything went wrongly because of the greed of the Kurdish leaders. They demanded the Iraqi government share its oil revenue with the Kurdistan Regional Government, with the KRG additionally earning revenue from oil drilling in Kurdistan. Of course, the Iraqi government was not imbecilic enough to consent to such a nonsensical proposition. Rightly so, the Iraqi government thwarted oil revenue sharing with Kurds, leaving the Kurds with revenue only from oil drilled in Kurdistan region as their primary revenue to support themselves. That would have been enough to pay for public services and secure public employees’ salaries should the oil have been sold at market prices, but it wasn’t due to gross corruption. When the Iraqi government issued revenue sharing with Kurds, two checks were cut: one for Barzani and the other for Talabani. They contributed a fraction of that money to public expenditures, and deposited the rest into their coffers. Even with that little give back, social services were managed meagerly, public employees were salaried, and people were doing much better by far than they were when Iraq was subjected to economic sanctions before the American invasion. But, after Iraq halted funding of Kurdistan, the two leaders split the oil revenue extracted in Kurdistan amongst themselves. As a result, public employees’ stipends were unpaid, social services suffered, and Kurdistan’s economy started deteriorating, leaving the majority of people at the edge of starvation. What the Kurds earned from fifty-seven years of revolution is bloodshed, with many losing at least one beloved member of their families. Many others lost their livelihoods or were jailed and tortured. Additionally, many lost just about everything, like those from Halabja and victims of Anfal when more than a quarter million people perished, and most were bulldozed alive. The real profiteer from fifty-seven years of revolution has been Talabani’s and Barzani’s families. They looted Kurdistan and became two of the wealthiest families in the world. At the present day, and looking forward, the Kurds are doomed with a great tribulation upon them. In Afrin and the rest of Syria, ethnic cleansing is in progress, forcing Kurdish people to leave their birthplaces. Those who are determined to stay are subject to humiliation and atrocities by the Turkish forces and their fanatic Muslim allies. Kurds in Iraq, like their brethren in Syria, are struggling. Arab Shiites, Moslem Sunnis, and Turkmens are descending upon Kurdish populations with iron fists, coercing them to leave their birthplaces, with the determination not to allow their return. Thus, an ethnic cleansing is underway in both Syria and Iraq. That is only the start, and it will end with an utter genocide altering the demographic of Kurdistan and dislocating millions of Kurds in a silent world, trading humanity for economic and trade reasons. Clear manifestation of this is pending upon the Iraqi government’s return to reclaim the Kurdistan Region of Iraq. The Kurdish hope for real autonomy, never mind independence, is far reaching. However, the Kurdish hope for freedom has withered, and their dream for independence severely damaged. Therefore, these leaders must be brought to the court of public justice so that their corrupted mentality will be revealed, their atrocities judged, and their wealth confiscated. Then, the Kurds will find new discipline to organize. Surely the impending developments will be tragic for the Kurds, but as has been said, the stars shine brighter in the dark. This implies that time and tragedy will find new righteous leadership as current corrupted leaders depart from the scene.